We drove up Looking Glass road to get a snowy view of Lower Two Medicine Lake. It had snowed on this road earlier in the morning when I was scouting locations and it created the perfect snowy icing on the trees. Kristen wanted a snowy Christmas tree look, and of course mother nature obliged. Did I mention they’re the magic couple?! 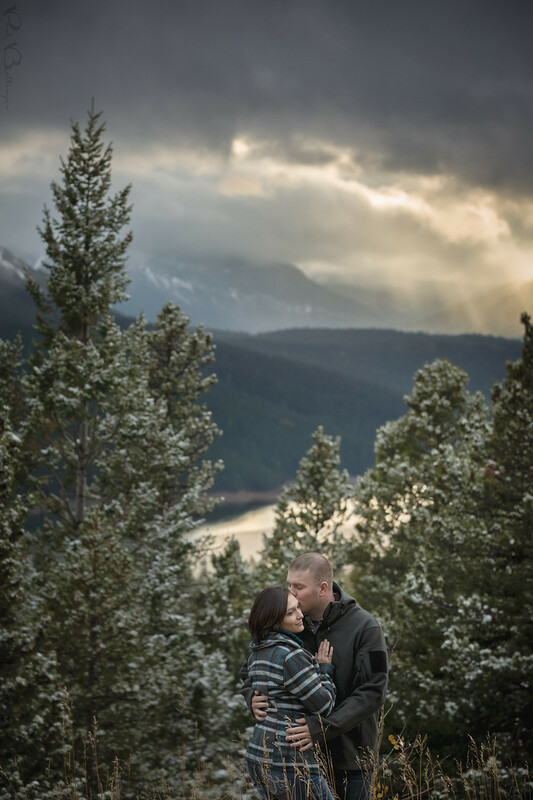 We had an awesome mountain engagement session in Glacier, and I can’t wait for the mountain wedding in Red Lodge Montana. Looking Glass road is fun and beautiful. There is no guard rail, so nervous drivers beware. The light was amazing, but I needed a second exposure to capture the light rays coming down the valley. The exposure on Kristen and Jake is 1/500th, f/5.6, ISO 640. For the sky, I blended in a second exposure which is two stops darker at 1/2000th of a second. I was shooting handheld using 5 stop exposure bracketing so I wanted a very fast shutter speed so there wouldn’t be much movement between exposures. There was a little movement nonetheless, but it was easy to line up the layers in photoshop.